Wouldn't that be a great band name? 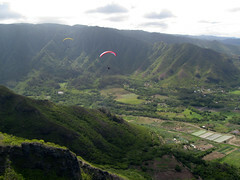 But actually I am talking about another sweet day flying at Kahana: Scot, Jim, Don and I flew in strong northerly conditions for a few hours this afternoon, and we had a great time exploring the limits of the huge lift band on the north side of the ridge. Scot plumbed the depths of the lift over the shoreline and the water, while Jim and Don pioneered the upper limits. Thanks to Jim for the post-flight refreshments.